“The story in public that the DS and SNS are being blackmailed is made up and it only serves as an alibi for the fact that there still are no negotiations about the forming of the government,” [Ivica Dačić] added. 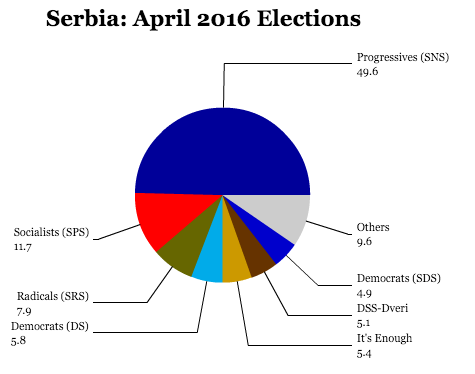 Don’t look now, but Serbia’s Democratic Party (Демократска странка / DS) may not be so firmly on the path toward government. President-elect Tomislav Nikolić’s Serbian Progressive Party (Српска напредна странка / SNS) may well now have a chance at being part of Serbia’s government as well, leaving former president Boris Tadić firmly in retirement, not the frontrunner for prime minister. In no uncertain terms, the most important man in Serbia today is Ivica Dačić. With recently defeated Serbian president Boris Tadić likely to become prime minister, and with his center-left Democratic Party (Демократска странка / DS) almost certain to control the government, as it has since 2000, Serbia’s domestic policy is unlikely to change much (somewhat curiously, as I discussed earlier), despite a very different president in Tomislav Nikolić. But on foreign policy, Nikolić will have a more amorphous — and powerful — hand, as Serbia begins to mark the first transfer of real power from pro-Western, liberal progressive forces that have controlled its government in the 12 years since Serbia was the chief pariah state of Europe. 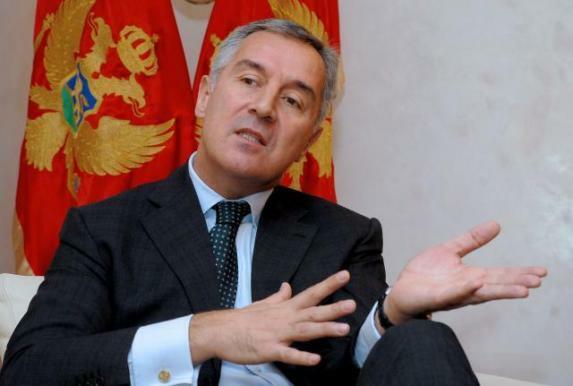 The one-time ultranationalist Nikolić will have won the presidency just two months after Serbia became an official candidate for membership in the European Union and just two years after Kosovo — populated mainly with ethnic Albanians, but also a significant population of Serbs in the north — declared its independence (yet to be recognized by the United Nations) in 2010. Today, during the campaign, and really, ever since his departure in 2008 from the more nationalist Radical Party, Nikolić has emphasized that his election would result in continuity for Serbia’s European integration. 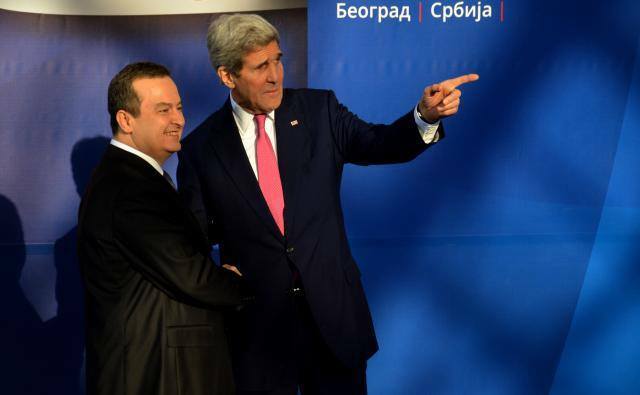 But only four years ago, as The New York Times notes in the lede of its profile on Serbia’s new president, Nikolić said it would have been better for Serbia to become a province of Russian than to become a member of the EU. 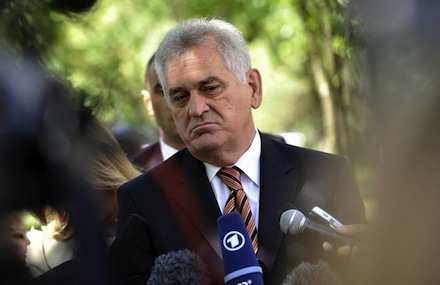 Following Serbia’s May 20 presidential runoff, which saw longtime challenger Tomislav Nikolić defeat incumbent Boris Tadić, Tadić has emerged as the leading candidate to become prime minister of Serbia. Nikolić — who was running for the fifth time — won Sunday’s runoff with 51.12% to just 48.88% for Tadić, who had served as president since 2004. In the prior May 6 vote, Tadić had won 25.31% to just 25.05 for Nikolić. Despite the fact that Nikolić’s party, the right-wing Serbian Progressive Party (Српска напредна странка / SNS), narrowly won the most seats in the simultaneous May 6 parliamentary elections, Tadić ‘s left-wing Democratic Party (Демократска странка / DS) has been in coalition talks with the third-place Socialist Party of Serbia (Социјалистичка партија Србије / SPS), which will continue notwithstanding Nikolić’s victory. The result, however curious, would be to block the new president’s party from government, notwithstanding the fact that the SNS won the greatest number of votes on May 6 and Nikolić won a direct runoff against Tadić — who now seems likely to become prime minister. In the event that Tadić had won the presidential runoff, it seemed likely that the SPS’s leader, Ivica Dačić, might become prime minister. 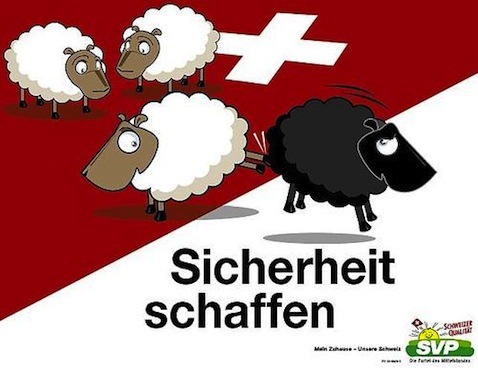 Although the SNS holds 73 seats in the 250-member parliament, the DS’s 67 seats and the SPS’s 44 seats bring them just 15 seats shy of a majority. It is expected that the DS-SPS coalition talks will continue with smaller parties in the coming weeks to form a government — former prime minister Vojislav Koštunica’s Democratic Party of Serbia holds 21 seats, the “U-Turn” coalition of various parties, holds 19 seats, and the federalist United Regions of Serbia coalition won 16 seats. 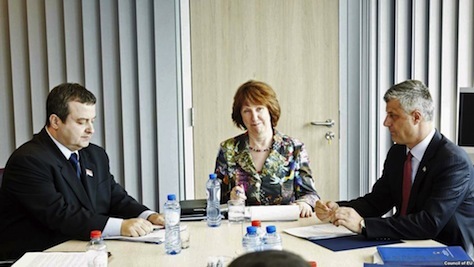 The DS, in coalition with various partners, has essentially controlled Serbia’s government since the fall of Slobodan Milošević in 2000. The prime minister has much more power than the president in setting domestic policy. 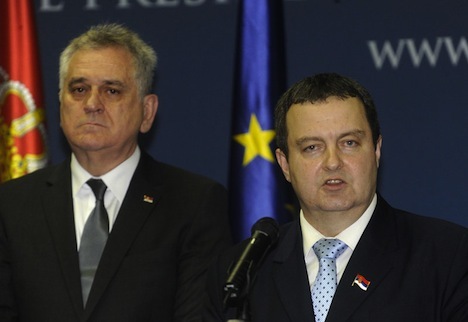 Although he is seen as more nationalist than Tadić, Nikolić pledged during the campaign that his presidency would mark continuity with Serbia’s integration into the European Union. Just days after protesting election fraud in the first round of Serbia’s presidential and parliamentary elections two weeks ago, Tomislav Nikolić of the right-wing Serbian Progressive Party (Српска напредна странка / SNS) has won the Serbian presidential runoff today, ousting incumbent Boris Tadić of the center-left / progressive Democratic Party (Демократска странка / DS), who has been Serbia’s president since 2004 and who was seeking a third term on Sunday. Preliminary results gave Nikolić around 49.7% of today’s vote, to just 47.1 for Tadić — if the result holds up and Nikolić becomes president, it will be the first transfer of the Serbian presidency from one party to another party in Serbia since the fall of Slobodan Milošević in 2000 — in many ways, the 2012 election was Serbia’s first ‘normal’ post-Milošević election, in which the campaign revolved not around foreign policy and the ghosts of Serbia’s past, but rather focused on Serbia’s sagging economy, the falling value of the dinar, Serbia’s currency, and unemployment rates nearing a continent-high of 25%. In the first round on May 6, Tadić finished with 25.31%, followed closely by Nikolić with 25.03%. In each of the past two presidential elections, Nikolić had lost to Tadić, and Tadić seemed likely to triumph again today. Nikolić had also contested earlier presidential elections in 2000 and in 2003. Nikolić’s SNS had won the greatest number of seats in Serbia’s parliament on May 6, but look to remain in the opposition after Tadić’s DS has made a preliminary agreement to form a coalition with the third-place leftist/nationalist Socialist Party of Serbia (Социјалистичка партија Србије / SPS. 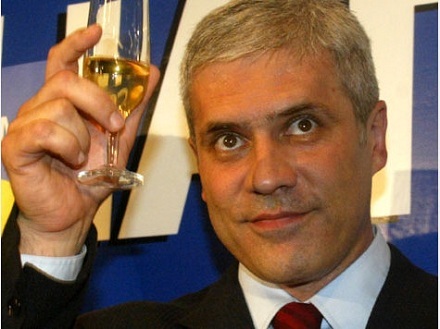 So what can Serbia expect with longtime opposition figure Nikolić as its new president? Given that the DS will now still largely control domestic policymaking in Serbia, and given the endorsement of Tadić by several other Serbian party leaders, including the SPS’s Ivica Dačić, it had seemed that the momentum was with Tadić, if just narrowly. 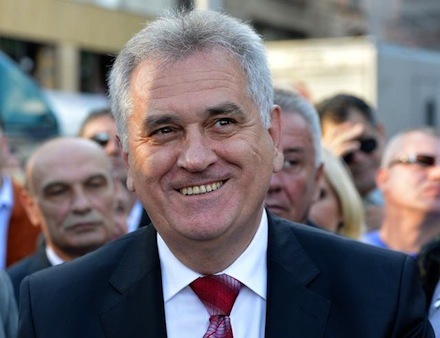 On Europe, Nikolić has spent much of his campaign convincing voters that is really, truly pro-Europe, despite a career in which Serbia’s new president has often seemed more comfortable looking to the east rather than to the west. Although the DS has steered Serbia toward a very pro-European course — Serbia became an official candidate for European Union membership just in March 2012 — both the SNS and the even more nationalist SPS (the SPS was once Milošević’s party) have pledged not to pull Serbia off its course for EU membership. As voters in France and Greece upended the pro-austerity front of the European Union Sunday, elections in Serbia confirmed the normalization of a country that just two decades ago was one of the most dangerous belligerents in the world. Serbia went to the polls Sunday for both presidential and parliamentary elections in what is being billed as the first normalized election since the fall of Slobodan Milošević in 2000. 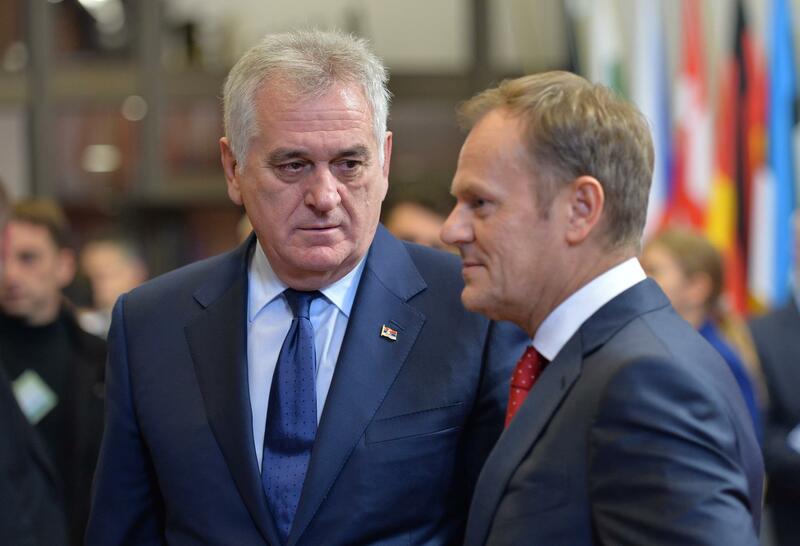 Although the new government is not yet clear, it will be certain to be a pro-European government dedicated to furthering Serbia’s candidacy — formally granted in March — as a member of the European Union. In the presidential election, incumbent Boris Tadić finished first with around 26.7% of the vote, with Tomislav Nikolić just behind with around 25.5%. The two will face off in a runoff vote to be held on May 20. 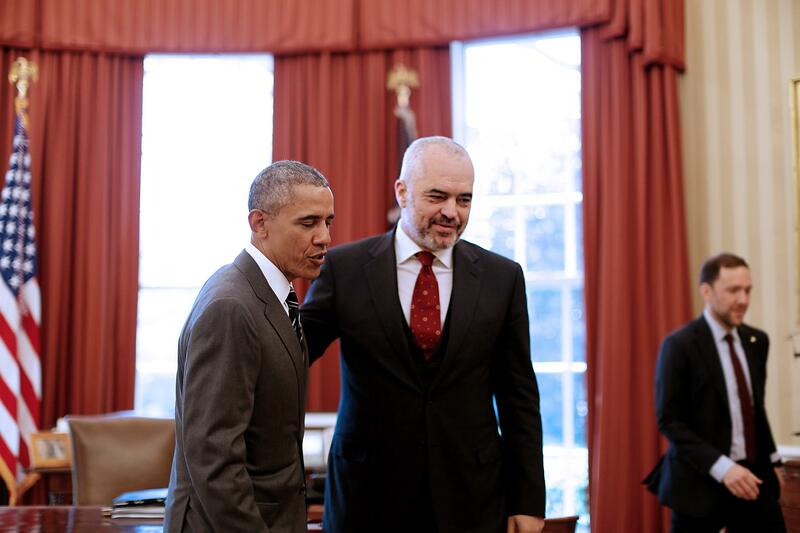 Tadić, a member of the center-left / progressive Democratic Party (Демократска странка / DS) that has governed Serbia since the fall of Milošević, was first elected president in 2004 and is seeking a third term. Tadić has twice defeated Nikolić in prior presidential elections, with just over 53% in 2004 and just over 50% in 2008. 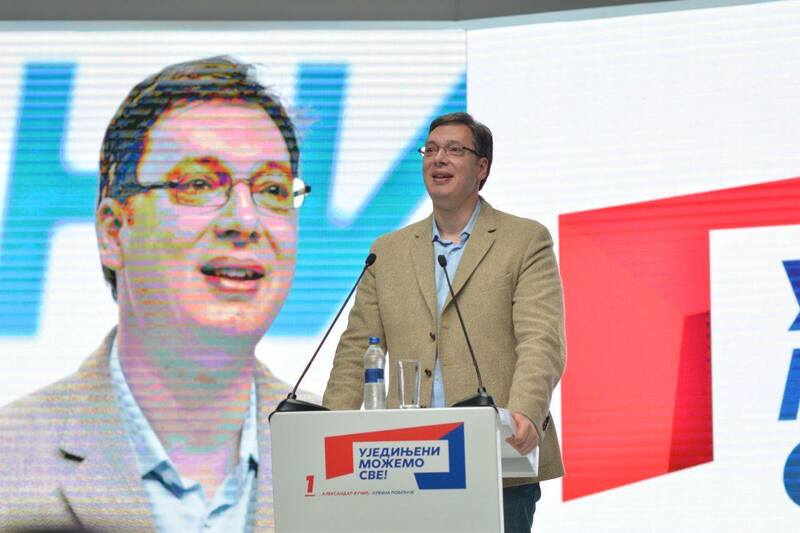 Nikolić is a member of the right-wing Serbian Progressive Party (Српска напредна странка / SNS). Although the SPS is more pro-Russia than the DS, it has worked to convince Serbian voters that it backs the country’s EU membership. Indeed, Nick Thorpe writes for the BBC that the “old split between pro-European and pro-Russian parties, is over,” with most major parties supporting EU membership. 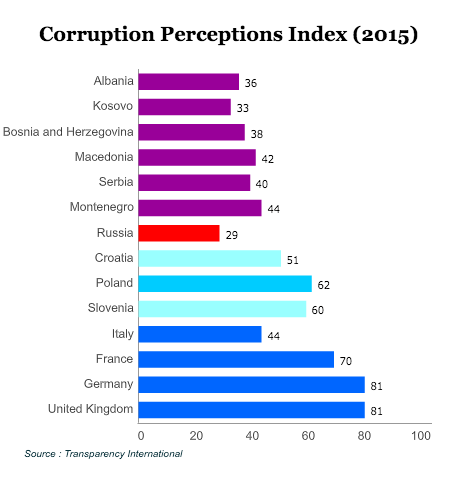 Instead of East-West foreign policy orientation, the election has turned on dissatisfaction with the DS amid Serbia’s poor economic performance. Unemployment has jumped to over 24%, while economic growth has stalled to near-recession levels in 2012. 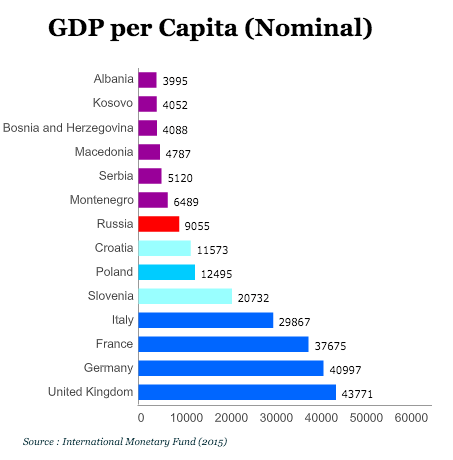 Serbia’s public debt has ballooned and its currency, the dinar, has lost 30% in value. 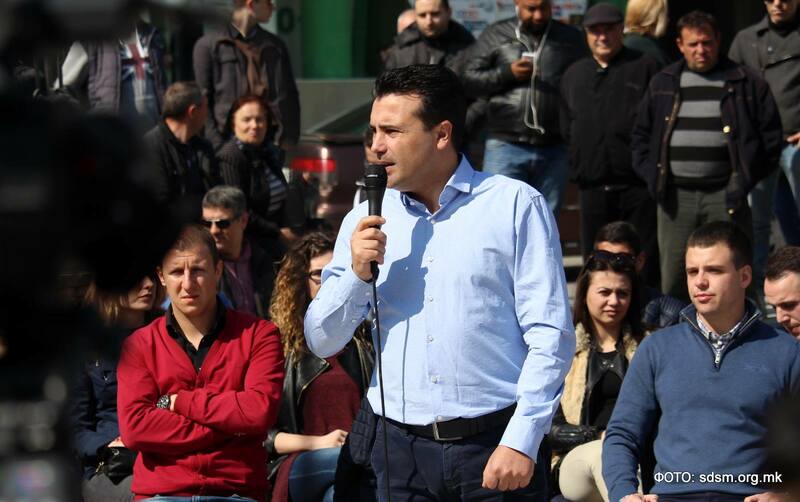 In the parliamentary elections, Nikolić’s SNS emerged with the largest vote, with 24% to just 22% for Tadić’s DS — although the SNS had been projected to win the election, its margin was expected to be wider. 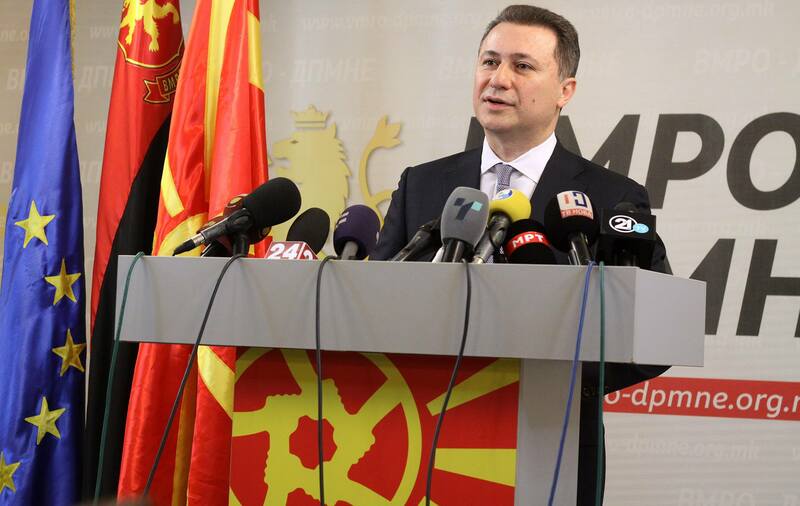 The election’s big surprise was the success of the Socialist Party of Serbia (Социјалистичка партија Србије / SPS), which won a strong third-place finish with 14.5%. The SPS, a vaguely leftist and vaguely nationalist party that Milošević himself founded, will now become the kingmaker in Serbian parliamentary politics. 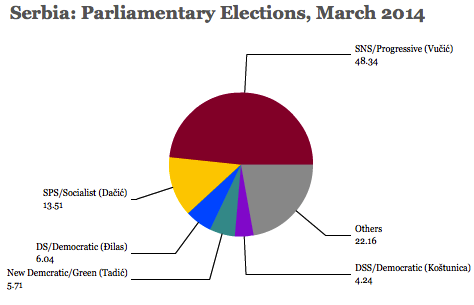 SNS is projected to win 73 seats in the 250-seat national assembly, with 67 seats for the DS and 44 seats for the SPS. The SPS leader, Ivica Dačić, a one-time ally of Milošević , has worked to pull the SPS back into the mainstream of Serbian politics in the post-Milošević era. 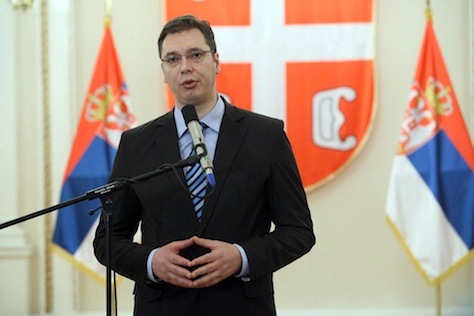 Dačić is now widely seen as the likeliest candidate for prime minister, in either a coalition with the DS or with the SPS. Dačić has said that he wants to hold talks first with the DS. Dačić finished third in the presidential election, with around 17%, and his endorsement may well be decisive in that rade as well.